Star Cops, which takes its title from a derisive name for our protagonists’ career choice, was created by Doctor Who veteran Chris Boucher and originally aired in 1987 on BBC 2 for a brief 9 episode run. Humanity has spread out into space and explored a decent part of the solar system, but there are still only a few thousand people living permanently off Earth. National and Corporate-owned space stations abound in orbit, and numerous exploration ships are en route to distant destinations. There are no aliens, no faster-than-light travel; the world of Star Cops is surprisingly hard sci-fi, for the most part. But where there are humans, there’s crime, and thus a need for law and order, and that’s how the International Space Police Force is founded. The cases the show deals with vary quite a bit, from the oddly mundane to barely believable schemes. David Theroux (left) and Nathan Spring (right) in space suits. The show follows primary protagonist Nathan Spring (David Calder), a rather irascible British detective who has very little interest in space and is practically forced into take the job of leading the ISPF, and who also owns a portable AI named Box that basically acts as his personal Google. His second in command, American David Theroux (Erick Ray Evans), is an overall more pleasant man and a former engineer; Pal Kenzy, an Australian, is a dirty cop who manages to worm her way back into the ISPF after a hijacking incident–competent, certainly, but not the kind of cop one would prefer to have around, and that goes double for Spring. Rounding out the crew are London copper Colin Devis, Japanese doctor and late arrival Anna Shoun, and Russian moonbase commander Alexander Krivenko. A surprisingly international bunch for a British show, and the episodes often involve settings in diverse countries. As a moderately hard sci-fi series, it’s pretty unique. Zero G on space stations unless explicitly stated to be spinning, mentions of the health effects of being in space, the difficulties of getting around in orbit, sound in space… the effects don’t always measure up to their aspirations, but they do try to portray things accurately. The model work for the ships is pretty decent, if low budget, and they all have looks that are quite contemporary for spaceship designs of the era. Some of the episode plots are interesting, especially once the series gets going. The most unbelievable thing about most cases is the amount of back and forth travel to Earth much of the cast seems to be doing. The method of slowly introducing characters over a series of episode is a pretty good technique which is fairly well executed. Each character gets a spotlight episode before joining the cast, and they are given a good reason to be recruited into the organization. Not much of an overarching plot, so while it was ended with one script left unproduced, it’s no cliffhanger. 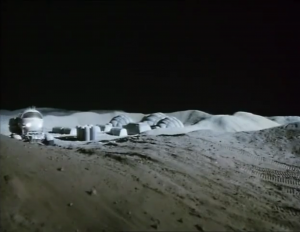 While the Star Cops were on a space station for the first 2 episodes, they move to this moon base for the remainder of the series. Probably one of the worst, most ill-fitting theme songs ever (and yes, that includes Enterprise). That may seem like a minor complaint, but I was ready to tear my hair out by episode 5. It just feels so wrong compared to the content of the show that it’s a jarring transition between them. The title sequence ain’t the most visually interesting one out there, either. As I mentioned above, they seem to spend way too much time on Earth. Almost every case seems to require someone to go back to Earth, and if not, they’re forced to go back for vacation. It’s understandable that spacefarers might need to go back to normal gravity once in a while, but if the astronauts on the ISS can go a year or more in 0 G, then our star cops on the Moon should be at least as good. It’s pretty clear it’s a budget thing, but… it’s odd for a show otherwise so hard. A lot of the Earth-based locations are just bizarre as well. Strange color schemes, weird architecture, etc. I have no idea what the intent was behind that, but it’s so distracting that it can be hard to pay attention to the actual scene. The overall slow pace of the show, by modern standards, doesn’t help in that regard. The show’s visual style is very cheap-looking, unfortunately. As it turns out, this was in part the result of a power struggle between the creator and the producer; the entire show is shot on Video rather than film, and a multicamera setup as well, giving the already low-budget sets that ugly soap opera feel. 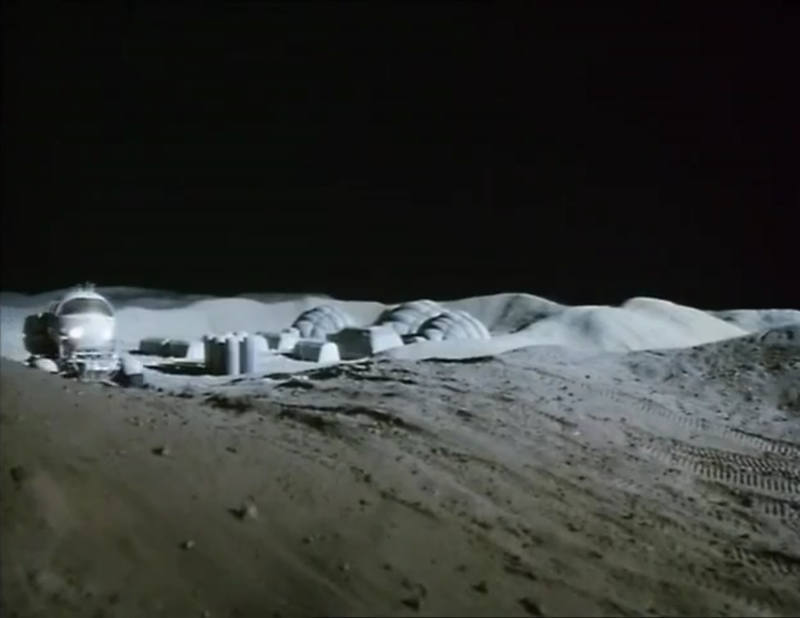 The creator, Chris Boucher, originally wanted to record location shoots on film and the studio-based space sets on video, hoping to give space a unique feel compared to Earth. I’m not sure how well this would’ve worked, given that the sets looked so cheap on video in the final product, but it definitely would’ve been an improvement over how it turned out. The biggest strike against the show is that… well, none of these characters are particularly memorable or even likable. Sci-fi fans will likely find Spring’s dismissive attitude towards being in space annoying, since he’s basically spitting on their dream. He’s a decent investigator, of course, but he also seems to be absolutely terrible at the task of managing the organization that he’s been saddled with. Theroux is amicable enough, and he and Spring eventually develop some rapport, but it’s too little, too late. Kenzy, as said before, is introduced as taking bribes and shaking people down, which makes it almost impossible to rescue her character (at least for me), plus there’s a weird feeling in a few episodes that the show is trying to push the Kenzy/Spring ship, even though they really don’t get along. Devis, for his measure, is about as cliche as a TV cop can be, overweight and rough around the edges. To him, the main appeal of being on the Moon is lower gravity. Krivenko doesn’t show up until the halfway mark, and Shoun is even later than that. This barely even qualifies as “bad”, but this show had one of the oldest instances of someone shouting “ENHANCE!” to get more detail out of a photo that I’ve ever seen. It’s so cheesy today, but the only time I can recall it being used prior to this is in Blade Runner. I might be forgetting some earlier examples, though; I’ve watched so much at this point it’s hard to remember it all. 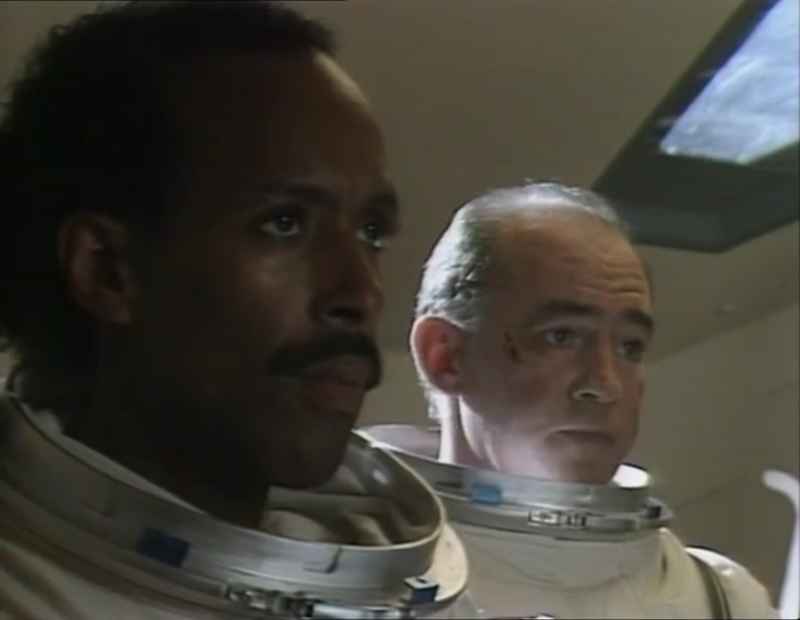 In the end, Star Cops makes a decent attempt at being a mash-up of hard sci-fi and police procedural, but it’s hampered by a low budget and a cast that doesn’t have a whole lot of chemistry. Learning there were behind-the-scenes issues was hardly a surprise, as the show bears a lot of hallmarks of one that’s suffered from creative differences. While some hail it as a forgotten classic, I’d say it hardly qualifies for that high of a recommendation. But if you do decide to give it a shot, it’s recently been picked up for an audio drama continuation by giant of the field, Big Finish, with a lot of the living cast reunited, so there’s further adventure out there for the fans who aren’t happy with just 9 episodes. 2.5/5 UFOs. Slow and cheap-looking, but admirable realism. A quick reminder of my rating system: a 5 represents must-see–a “hidden gem,” as it were. A 4 is good, solid television. A 3 is “cult classic” stage, where the show’s appeal is likely limited to a specific group. A 2 is flawed, but fun, or even “so bad it’s good,” depending on the series and its release timeframe. A 1, of course, is avoid at all costs. If you want to give Star Cops a shot, I’d suggest episodes 7, 9, and 4 the most. Episode 9 has what is probably the zaniest criminal scheme I’ve ever seen on TV. 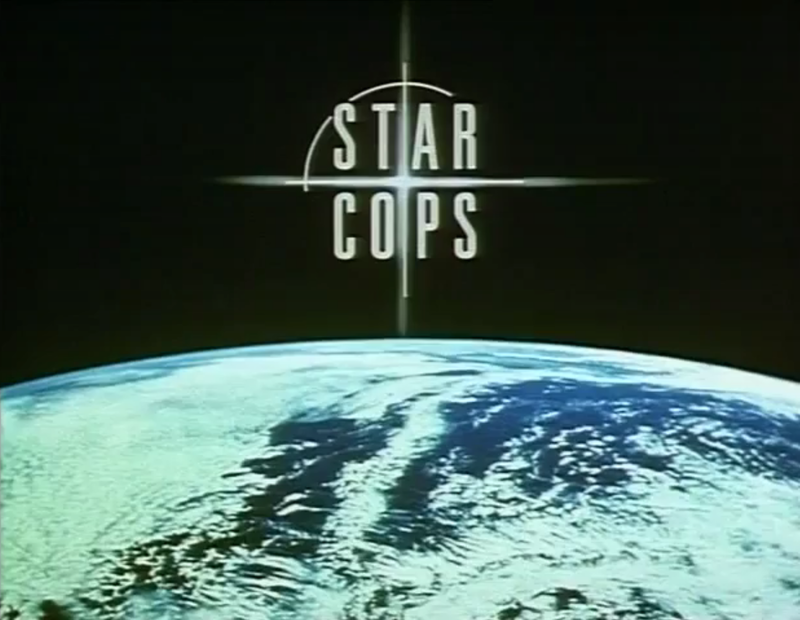 Unsurprisingly, Star Cops doesn’t have great availability on streaming services, but you can find it on youtube here. This was a really good write up on a show I’ve never even heard of, but now I am really curious what kind of cases they got into. Thanks for posting!